Business analysis can be very rewarding. How would it feel if you could walk into your boss' office tomorrow and tell her you have solved the inventory problem? What would she say if you told her that you have performed a regression analysis and can predict sales for the next 2 years? This website is dedicated to helping you impress your boss with your business analyst skills even if the boss is you. Why you should use it. An example of its use. There are included within this website many techniques that are useful for the business analyst. A business analyst may wear many hats. Some of them are data analyst, system analyst, decision maker, financial analyst computer analyst and management analyst. The analyst's job can include such functions as determining the business requirements, analyzing business intelligence, and conferring with management about business strategy. The solution pages on this website are mostly about qualitative(non number) factors. These factors include decision making and getting patents and the background for the numerical analyses. The goal will be to help you understand the pieces to solve the whole problem. 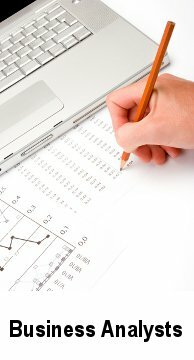 The quantitative pages will have calculators and spreadsheets that will help you to do decision analysis, financial analysis, create a graph or do a SWOT analysis. Business analysis is all about solving problems! What kind of problems, you might ask? Well, any problem that arises from a moneymaking activity. That could be a billion dollar corporation down to a small mom and pop grocery store. It could even apply to problems that an individual is having with her profitable hobby or that an investor is having with his wealth building activities (npv and irr). If you are a small to a medium sized company needing help to solve business related problems, then this website is for you. You probably can't afford to have PhDs and MBAs solve your problems. You don't need to be a certified business analyst to figure out your business. You are the one who needs a quick solution to the roadblocks that threaten or limit your income and opportunities. With my website, I want to help you to make more money. Start by searching my website for the answer to your business problem, using the search tool in the upper right hand corner. Welcome to my business analysis website. My name is Dee Reavis. As an industrial engineer, I have specialized in finding ways to solve business problems. It is amazing how a relatively simple technique can yield big results. I invite you to explore this website. You may well find business analysis methodologies that will save your company thousands of dollars. Remember that a dollar saved, solving your venture's problems, is the same as a dollar earned. 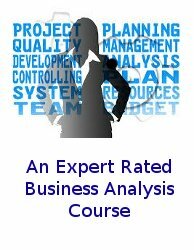 Here is a suggested course that provides an introduction to business analysis. This is a scholarly article on decision making from Stanford University. After a review of decision making literature the article considers rationality, bounded rationality, politics and power. Why is Net Present Value important? Is this the best method for comparing the economics of projects? What other methods are there? What’s the preferred decision-making process? If you are a member of a team, what are the preferred decision making process? Explore the Norms that exist in a team.